I know – how could this not be as good as it sounds? Goddamn beets got me again. After enjoying my marinated beet salad so much I thought I’d pull a Jesus and turn the other cheek, try and welcome all beets back into my life. Unfortunately, Jesus has once again out done me, for I simply cannot forgive what these beets have done to me. I might be being a little unfair toward beets – the purple carrots can’t be totally blameless here. Purple carrots are just carrots that happen to be purple – nothing more exotic than that. In fact, before the reign of William of Orange in the 16th century it was more outlandish to see an orange carrot than a purple, red, yellow or white carrot. Allegedly, as part of a great ploy, the farmers of the Netherlands teamed up to produce nothing but orange carrots as to pay tribute to their king, thereby establishing orange as the standard color for the last 500 plus years. Pretty good tribute guys! To return to the subject at hand, this ungodly combination was the worst thing I have drank in recent memory. I hope this blog goes somewhat toward testifying my openness to even the strangest foods and my willingness to consume anything food like, because I assure you this is the case. This beet juice simply affirmed all my worst fears and suspicions about Satan’s vegetable – all the horrible taste of drinking the liquid canned beets come in, combined with a cloying, lingering flavor that simply will not leave your tongue alone. I’m afraid I found this one simply undrinkable, and I don’t say that as a knee-jerk reaction. I am proud to say that I managed to give it my level best and fight my way through an entire glass, though it was consumed in small sips with generous periods of walk-it-off time in between. I could do no better, and was relieved when I was finished with it. Wasting food was deeply ingrained in me as a sin, but I will dump this muck into a gutter and laugh at it’s demise. That said, the juice is good for you. It’s phenomenal for you in fact – so chock full of Vitamin A, C, Iron and Calcium that if you drank it daily you would all but explode in a thunderous shock wave of healthy energy. I’m sure there are beet fans and health fanatics alike who embrace this product as an exciting new way to drink their favorite vegetable. I don’t care, and will do my best to avoid having my eye line accidentally cross sight of another bottle ever again. Beets – you got me again! Damn you beeeeeeets! Would I Recommend It: Uh, like no. Would I Buy It Again: It’s hard to imagine a situation so dire that I would be compelled to. Final Synopsis: Beets are monsters and they should all be destroyed. This is health food. It is not supposed to taste good. It is good for your heart, it has been clinically shown to lower blood pressure, and it may help reduce the chances of getting colon cancer and bladder cancer as well as helping to detoxify your liver. That being said, I actually liked it. But then, I like beets. And I like carrots. So, it’s probably a beet thing. If you don’t like beets, why on earth would you think this would taste good? To make it a bit more palatable, try blending it with a fruit juice you actually do like. I suggest mixing it with blueberry juice. They’re both very good for you, but blueberry juice tastes great to almost everyone. Actually, I find it mixes well with vodka. Smooth, Slightly sweet. Enjoyable. Different. 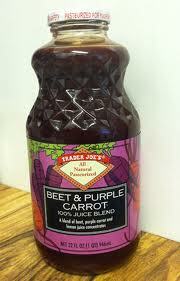 I have read your blog just before opening my first bottle of TJ’s beet and purple carrot juice. After reading your comments I was so afraid of even opening the bottle! I opened the bottle, smelled the juice hesitantly, and surprisingly it was smelling good! I filled a glass with the juice, and stared at it for almost 2 minutes, sniffing and waiting for the right moment to taste it. Since I am pregnant, I did not want to wake up my nausea, too! When I found the courage to try it, I tried to imagine something sugarless, and soily. As I tasted the first sip, I actually liked it! It was not totally sugarless, just the right amount, since I don’t like the heavy sugary taste in most of the grocery fruit juices. I am drinking it now happily, without mixing with anything. Maybe my expectations were so low after reading the blog. 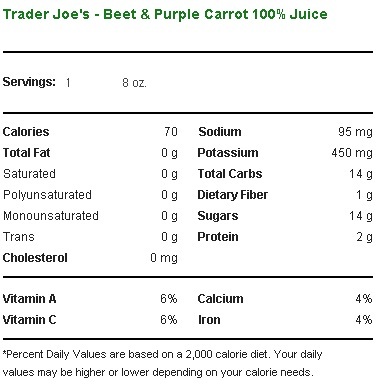 Or, I really like the earthy taste of beet and this juice met my expectations. Sorry, but I loved it. Cant get enough. I’m a huge fan of purple and red fruits, veggies and their attendant juices. Somehow knowing what you are consuming could be a lifesaver over the long-term just adds to the pleasure of a big tall chilled glassful. Often neat but sometimes added with seltzer as a spritzer to make it stretch and reduce the thickness, I do the same to TJ’s wonderful Tart Black Cherry Juice and the low sodium Tomato Juice. Great value, and great for you. I thought the purple carrot and beet juice was very good, and it was a lot cheaper than the little $7 bottles of pure beet juice at Whole Foods. Beet juice does lower your blood pressure. But this juice is no longer carried by our Trader Joe’s. I wish I could find it somewhere.